collectSPACE - news - "Shuttle Atlantis flying its flag for final flight"
May 12, 2010 — Space shuttle Atlantis is marking its own final planned flight by flying its flag. 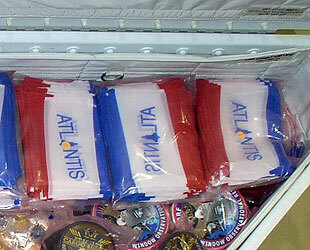 Thousands of the red, white, and blue "ATLANTIS" flags, miniatures of the type flown over the launch pad each time NASA's fourth orbiter has sat poised for liftoff, are packed inside a modified tool stowage assembly located in the shuttle's payload bay. 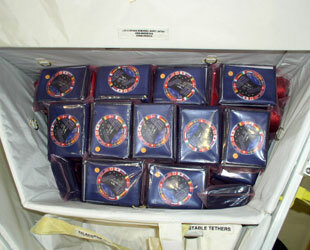 The 3,600 four-by-six-inch nylon flags (a subset of which are for sister shuttles Discovery and Endeavour), together with other memorabilia including 700 space shuttle-shaped lapel pins and two almost two-foot-long rolls of gold foil, are stowed starboard, or to the right, of Atlantis' airlock, opposite a similar triangular, trunk-size container packed with International Space Station (ISS) souvenirs. Both are forward of Atlantis' primary payload, the Russian Mini-Research Module-1 (MRM-1). Set to lift off on Friday, May 14 at 2:20 p.m. EDT (1820 GMT), the flight is slated as Atlantis' 32nd and last mission. 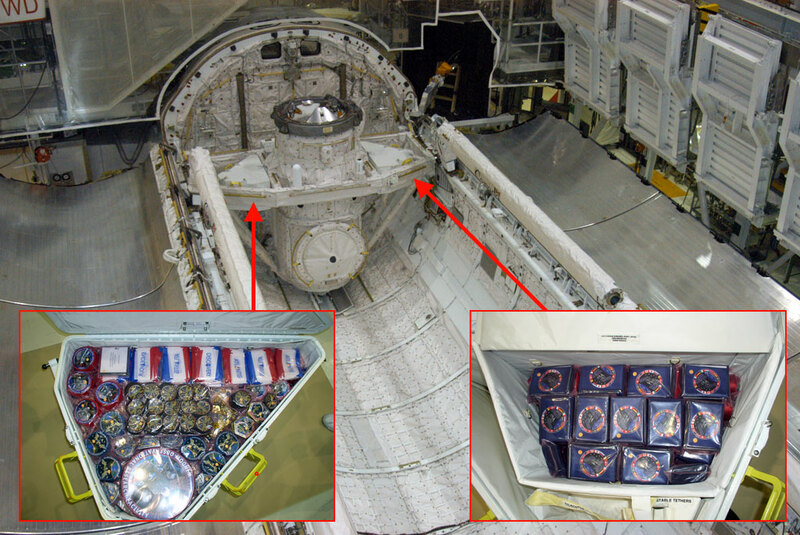 "Both [containers], one to either side [of the airlock], hold memorabilia, Official Flight Kit-type items," Robby Ashley, payload manager for Atlantis' STS-132 mission, said. 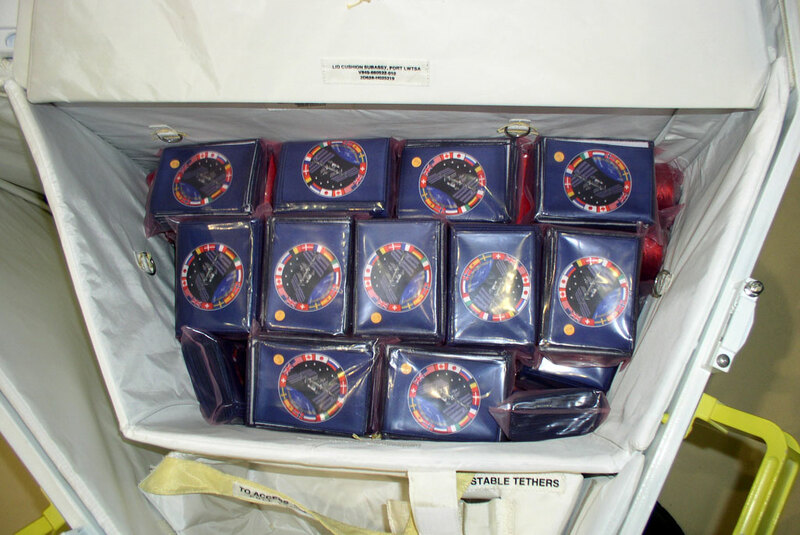 The Official Flight Kit (OFK) is a milk crate-size container flown on all space shuttle missions inside a locker located on the mid-deck of the crew cabin. Inside, NASA and the astronauts fly items for organizations that have supported their mission's success. 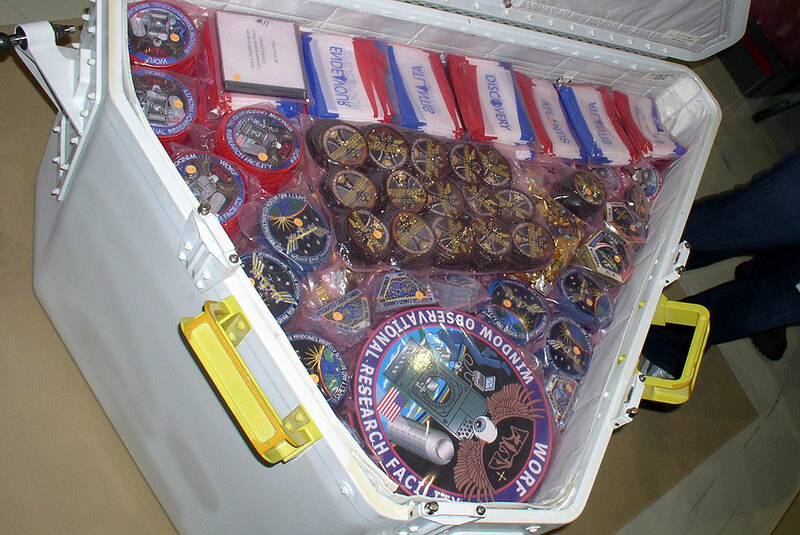 With Atlantis' interior OFK fully-packed with mementos for the STS-132 mission, NASA desired additional room to fly commemoratives specifically marking Atlantis' final flight. "They added [the additional container to the payload bay] specifically for this when it was obvious there was going to be additional weight capability for launch," said Ashley. 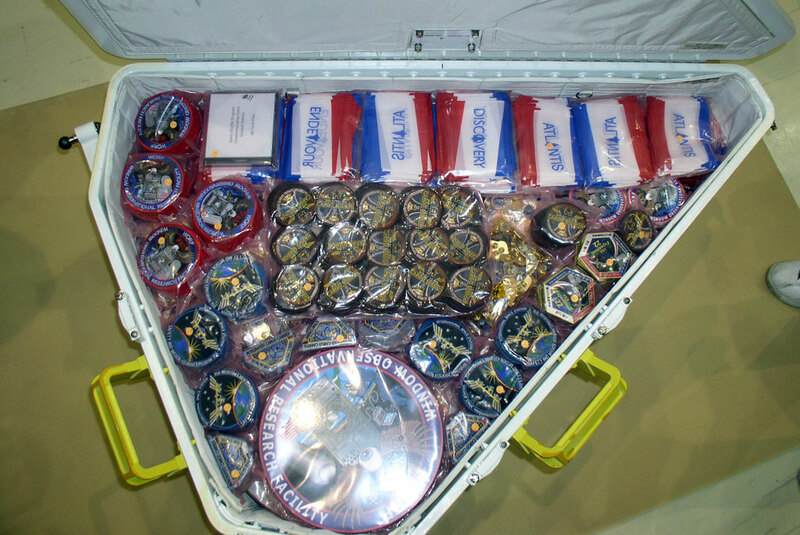 Besides the flags, pins, and gold foil rolls, the exterior tool containers are also filled with 3,000 laminated bookmarks, 1,200 shuttle and 1,312 station program flags, hundreds of embroidered patches, and 16 three-by-four-inch thin metal ingots to be used post-flight to mint coins. Like the items inside the more traditional mid-deck OFK, the soon-to-be-space flown souvenirs in the cargo bay will be left untouched during the mission to be distributed to employees and VIPs after Atlantis lands. Packed inside Atlantis, as well as sewn to each of the six STS-132 astronauts' pressure suits, are cloth patches that also commemorate the end to Atlantis' spaceflight career. 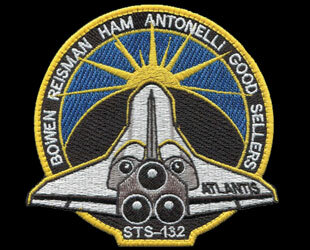 "Having the shuttle -- and Atlantis in particular -- flying off into the sunset, I think is certainly appropriate," remarked STS-132 mission specialist Garrett Reisman, who led the patch's design for the crew. "We really felt that, given this point in history, it was really important to recognize that." But there's a second, more subtle meaning to the emblem that also references a beginning. "Since the shuttle flies toward the east, we are actually flying into the sunrise," Reisman revealed, "and that sun is rising over our new module, 'Rassvet.'" "So, it is also the sun heralding the new research that will be performed inside this module." Reisman told collectSPACE.com that the insignia was the result of a mini-design contest held among his friends and family. "We got back almost like a hundred different submissions, it was really amazing," he said, adding the designs came from all over the world. "Then our job was basically taking the hundred different designs and then narrowing it down." "Several had that sun-peaking-over-the-horizon motif. We thought the symbolism of that was very appropriate. There were two that had the sun over the horizon and the shuttle flying off into it, and the final patch is a combination of the two," recounted Reisman. He identified the two "winning" design artists as a friend of his sister's in New Jersey and a former contractor to the Kennedy Space Center in Florida who's designed several previous shuttle patches. In addition to the crew's patch, of which there are over 600 aboard Atlantis, the OFK is flying the results of two other emblem design contests. All 85 ideas submitted late last year by NASA employees for the space agency's commemorative patch marking the end of the space shuttle program are flying in digital form, saved to a CD. And the winning design in a children's contest to create a space patch for the animated character Buzz Lightyear is also flying, continuing an educational partnership between Disney and NASA that earlier flew a 12-inch toy version of the "Toy Story" space ranger. 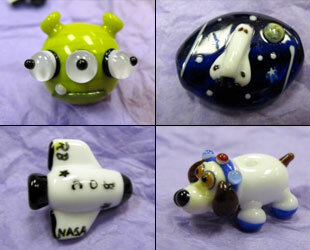 The results of yet another art-related contest can be found in the form of 17 glass beads in the OFK. The string of custom beads, each with a space-theme, are flying for Beads of Courage, an organization that supports arts-in-medicine programs for children coping with serious illness. After Atlantis returns, NASA will present the string back to Beads of Courage as a symbol of support to sick children everywhere. The idea behind the beads and the contest to design them came from Jamie Newton, a Marshall Space Flight Center support contractor employee whose six-year-old daughter has received over 450 Beads of Courage battling cancer. "It is a great honor to be a part of and support a wonderful organization like NASA," Newton was quoted as saying on the space agency's website. "This opportunity to fly the Space Beads of Courage onboard space shuttle Atlantis will help children battling cancer and hopefully inspire them to be among the next generation of astronauts and engineers; making it possible for all of us to see what lies beyond our Earth." 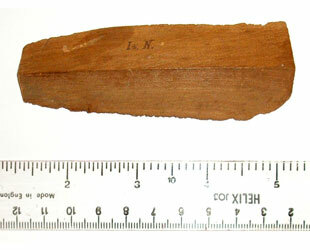 Newton's glass beads are sharing space on Atlantis with a different Newton's wood. 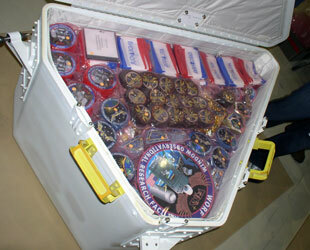 Among the patches, pins, coins, and flags inside the OFK at the request of the STS-132 crew members, British-born astronaut Piers Sellers packed a piece of wood. "We have from the Royal Society of London a piece of Isaac Newton's apple tree; the apple tree from his garden under which he was sitting when the apple fell off," Sellers told collectSPACE.com. "Hence, Newton's thoughts about gravity." "We are going to take up, let it float around a bit, confuse Sir Isaac, and then bring it back and give it to the Royal Society and they'll put it somewhere." The following is the STS-132 Official Flight Kit manifest, as provided by NASA. Inventory numbers that are missing indicate items that were removed prior to launch. Items 22 through 81 are manifested at the request of the STS-132 crewmembers. 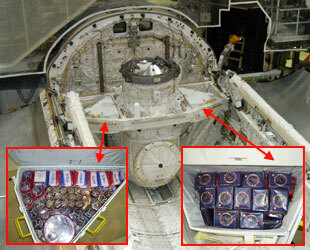 Items 82 and 83 are manifested at the request of the Space Shuttle Program Office and Payload Customers. Addendum items 1 through 25 are manifested at the request of the Space Shuttle Program Office.